Please explain how you tighten or lock the the initial stitch in the city grips. 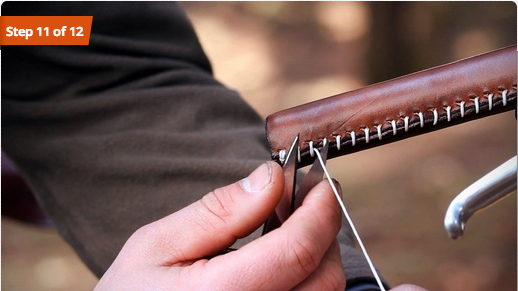 It seems in the YouTube instructional video the the first stitch still has thread hanging off by the time you finished with the surgeon’s knot. In the video, I use one needle, and one length of thread. This requires a knot to be tied at each end, but to make sure to pull the thread down tight, first I stitch the thread all the way through, leaving one end slack. Then I go through it again, pulling tightly to cinch the leather together, before tying any knots. At this point the thread it tight and there is no knot on either side; and the thread doesn’t become loose. Then I tie a knot at one end, and and then the same knot at the other end, both times pull the tail through the underside of a stitch or two before cutting the end off. There is enough friction between the thick sail-maker’s thread and the leather so the tucked-in tail threads don’t slip loose.